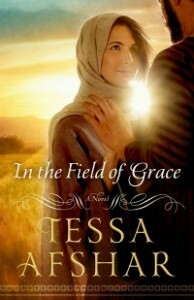 In The Field of Grace is fourth book by Tessa Afshar, and is a sequel of sorts to my beloved Pearl In The Sand. It tells the story of Salmon and Rahab’s son, Boaz, and his Ruth; one of the most famous love stories in the Bible. As with her previous books, Afshar brings to life a well-known Biblical tale in a marvellously realistic way. I feel like I’ve experienced indifference from a family in Moab, hostility from a community in Bethlehem, gleaned wheat in Boaz’ fields, fallen in love with the perfect gentleman in an olive grove and found a love so pure it will be remembered for thousands of years. The book of Ruth is a short one of only four chapters, but Afshar has managed to turn Ruth’s story into a very believable account of what Ruth’s life could have been like. As much as In the Field of Grace (and the book of Ruth) is about the love Ruth bears for Boaz, it is also about the love Ruth bears for her mother-in-law, Naomi. Even after the death of her husband, Ruth refused to separate from Naomi. Instead, she joined Naomi in a move to Jerusalem, a place where she knew she would be unwelcome at best. Ruth’s love for Boaz and her love for Naomi carry equal weight in this telling, a very clever touch, as historically Ruth is as well known for her love for Naomi as she is for her love for Boaz. My only complaint in this regard (and it is a tiny one) is that Ruth and Boaz only meet approximately 25% into the book – I adore Boaz and I love him and Ruth together, so this complaint is just me being greedy and wanting even more of them. I find it wonderfully poetic that Boaz falls in love with – and marries – a Caananite who came to love Jesus, much like his father and mother. Rahab’s pearl earrings also make their way into the tale of Ruth and Boaz’ romance; a lovely touch by the author that made me extremely happy. I love all the colourful characters in the book. Ruth is wonderful; her legendary courage and loyalty is brought to life so beautifully. Likewise, the character of Boaz is every inch the perfect gentleman, tender and kind – just like the Bible portrays him. I felt very frustrated by Naomi at times, but I think in that the author illustrated just how bitter Naomi had become after the death of her husband and sons, and how Ruth’s love and God’s grace ultimately healed her hurts. I adore Dinah and Adin and wish there was even more of them! Tessa Afshar has become one of my favourite authors, flawlessly bringing life to tales from the Bible. I eagerly anticipate each of her new books, and she doesn’t let me down. I don’t know what Afshar plans to write next, but I am still clinging to hope for a book about Lysander and Roxanne (from Harvest of Gold). Here’s hoping. In the Field of Grace tells the complete, but fictional story of Boaz and Ruth, and of Naomi, Ruth’s mother-in-law. To read the TRUE STORY, read Ruth’s book in the Bible. Naomi (and Naomi’s son Mahlon, who was Ruth’s first husband) introduced the Lord to her. So I guess that’s how important the role of Naomi is. It definitely shares the story mostly from Ruth’s perspective, her fears and doubts of going to Bethlehem, and of marrying Boaz. There were some connections made to David (who is Ruth and Boaz’ great-great grandson) and Solomon, who is David’s son. And of course, let’s not forget, a direct relative of our Lord. This book is a really, really good read. I recommend it, especially to those who have hesitations in reading the Bible. It’s not an alternative, but most definitely an aid. I have to say that after reading this book, I think I’m able to understand better the story beneath the lines. Click here to read more reader reviews of In the Field of Grace. This book is GREAT!!! It is capturing, and makes me want to study the book of Ruth in a different perspective. Such a beautifull, heartwarming, overwhelmed book, “In the fields of grace”…the lovestory about Boaz and Ruth…for me the most beautifull story of the bible…i wanted to be like Ruth…she is so straight and powerfull…she left everything after her, her family, friends and everyone around her…at go…just go, without asking “what if i…and what will the future bring-question”….her love for God is so big, great and amazing!! I still wanted to be like her!! No afraidness…nothing at all, just believing and loving God!! Tessa, is my most loving author and her books i read-re-read and re-re-re-read them several times!! For me such a jewels!! And Tessa, is an angel for me! Send by God! Soblessed toreadTessas’ books. When I finished this book, I read through the book of Ruth,and I am now reading through Nehamiah, since reading another of her novels.